The IRS says total tax liability for 2010 was $997.5 billion. Perhaps $98.5 billion in uncollected liabilities explains the discrepancy between their data and the Joint Committee on Taxation's $899 billion in tax receipts, but in any case it's close enough for our purposes. Now look at the entry for the year 2000 in the Tax Policy Center data. This was the last time we had a reasonably healthy peacetime economy. In constant 2005 dollars our revenues were $2.31 trillion and our outlays were $2.04 trillion, with a $269.5 billion surplus. In contrast, our 2012 revenues were $2.09 trillion and our outlays were $3.02 trillion, with a $928.7 billion deficit. Deficit spending is certainly necessary in an economy whose center was ruined by centrifugal taxation and profligate military spending, but getting outlays down to around $2 trillion (again in constant 2005 dollars) is not an unrealistic ambition for a healthy steady-state economy with a strong center and low defense spending. 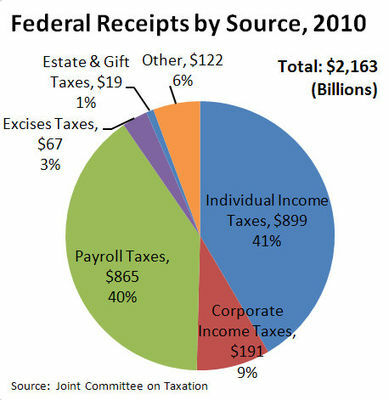 41% of $2.31 trillion is $947 billion, but a surplus will need to be run for many years to right the wrongs of the past, so we need $1 trillion in federal income tax each year, and a few billion more would probably be a good idea. Ready for a centripetal taxation system that will make that $1 trillion and restore a strong economic center? Build it!